Turin faces Glaurung on the bridge of Nargothrond. Illustration by Kip Rasmussen. Two minutes later, after a long musical introduction but just after the first sentences came out, my jaw dropped. There was Eru, the One, who in Arda is called Ilúvatar; and he made first the Ainur, the Holy Ones, that were the offspring of his thought, and they were with him before aught else was made. And he spoke to them, propounding to them themes of music; and they sang before him, and he was glad. Was it just a lofty beginning? A poetic moment in a world-building prelude that precedes many a fantasy novel? No. Something about its confident simplicity told me otherwise. There was a mastery here… a truth, a depth, a something that went so far beyond the imaginativeyarns of a mere book. This was something both new and ancient. As it went on, concepts ignited that stretched from deepest mythology to cosmic sci-fi, and characters emerged that complex storylines would breathlessly attempt to chase. As a fantasy reader, the curtains pulled back to reveal a heaping, exotic banquet of living worlds, teeming magic, and unforgettable inhabitants. As a fantasy writer, I knew that I would be forced to measure anything I would ever write against its towering awesomeness. This was J.R.R. Tolkien’s The Silmarillion. Thingol and Melian meet under the stars in Nan Elmoth, beginning a portentous love story. Illustration by Kip Rasmussen. Some may call The Silmarillion the history of Middle Earth—but how can it be a mere history when it transports you to the plains of Ard-galen, where the dwarf army halts the advance of Glaurung, father of dragons; and to the bridge of Tol Sirion the island fortress, where Luthien Tinuviel, searching for her beloved, strips Sauron’s power with a song of earth-shaking beauty. Some may call The Silmarillion the foundation of The Hobbit and The Lord of the Rings—but how can it be just a foundation when it contains those stories and so many more, making them seem almost as footnotes before the grander narrative. A line here and a line there can’t begin convey the epic awesomeness of the stories in The Silmarillion. The one I quoted above is actually the climactic conclusion of a tale of rebellion, betrayal, tragic love, and heroism set against a clash of cosmic forces. The Silmarillion is hard to read! The fact is, it reads more like a history book—or the Bible—than a novel. It’s not something you typically cuddle up with and plow through in a single sitting. Most fantasy fans and normal humans simply haven’t read it. But that doesn’t change the fact that The Silmarillion is the most underappreciated work of fiction ever written, and in fact it is one of the mostly underappreciated works in all of literature. How dare I throw around such haphazard superlatives? How can I make such a grand sweeping statement, without even a corroborating PhD attached to my name? Well, with the mighty strokes of my keys, I just did. But when something so distantly outpaces every other piece of fantasy you’ve read, it deserves some lofty praise. The new October 2014 cover of the Silmarillion as found at Amazon. I will not attempt to disentangle the many arguments for and against my grandiose statements, nor will I attempt tasks far beyond me—such as as filling the tomes required to define “greatness” in fantasy and literature, or listing the countless books and movies that owe their vital organs to Tolkien. I will simply try and persuade Tolkien and non-Tolkien fans alike to read it. In Part 2, I will tantalize fantasy fans with a Middle Earth appetizer that will make you pause the 900 page sword-and-sorcery tome that has you spellbound with cliffhangers at the end of every chapter. In Part 3, I will provide the mystical answer of how get into The Silmarillion and love it, even if you’ve tried before (which will include a Silmarillion MOVIE). Many thanks to Kip Rasmussen for allowing me to use his art in this article. See more and order prints at KipRasmussen.com. So, in Part 1, I unapologetically lavished praise on J. R. R. Tolkien’s masterpiece—a masterpiece among masterpieces, yea a towering feat of literary and fantasy profundity: The Silmarillion. A few of you chuckled compassionately. A few of you nodded gravely. A few of you rolled your eyes. To all of you I say: read it again! Ungoliant (ancient ancestor of Shelob) traps Melkor, and demands that he feed her the silmarils–the stolen jewels that contain the last light of Valinor. Illustration by Kip Rasmussen. And now, as promised, I shall tantalize Lord of the Rings fans with a “Did You Know?” apéritif that should get you to order up the main course at your favorite book store. …That Sauron is second in command to the real Dark Lord? …That he used to be quite a handsome chap? …That he abased himself before a distant relative of Aragorn? …That Aragorn is not exactly… human? …That the world used to be flat? …That there are different species of elves? …That the first dragons had no wings? …Why ents can walk and talk? …That orcs are afraid of water? …Why Galadriel is so mighty and so haunted, and that she left and returned to Middle Earth thousands of years before even Elrond was born? …And, perhaps most importantly, do you know what actually lies in the “West” that Frodo sails off to at the end of LOTR? And if you’re still holding back, in Part 3 or 4 (I haven’t decided which) I’ll tell you the surefire way to get into that thick Silmarillion prose and love it. 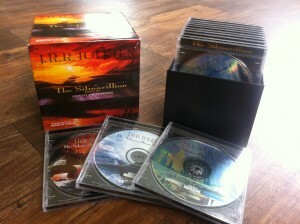 There’s a Silmarillion movie in this post… What? A Silmarillion movie?? 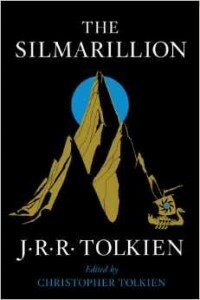 In Part 1, The Silmarillion was praised and placed in its rightful place as one of the great works of literature. In Part 2, Lord of the Rings fans were tantalized with some of the deep back stories that bear up Middle Earth, found only in The Silmarillion. Here, in Part 3, I now SOLVE the problem most people have with the The Silmarillion, that it’s too hard to read. The answer: don’t read it! Listen to it. But, this nice little picture probably won’t help you much. To give you a really good idea how fabulous it is, I’ve put together a little video with excerpts from the audiobook, and fabulous Silmarillion art by Kip Rasmussen.